Vodafone users in Europe, India, Australia and New Zealand will now be able to access the Last.fm service on their mobiles. Europe launches today and the UK follows in a couple of days. Vodafone Germany subscribers have the extra benefit that they can purchase the tracks that they hear on last.fm via the Vodafone Music service. One of the features that makes Last.fm stand out is “Scrobbling” – it monitors the tracks that you listen to and those that you reject, building a profile of the music that you like. With this it’s able to make recommendations of other music that you might like. Not only is this great for the listener, but without realising it, every day you use the service, you’re investing more of ‘you’ into the service, making it harder to move away from – thus making it good for the company. If you moved to another service you’d have to start the whole process again. A number of Nokia handsets – N95, N96, N78 and 6210 – will support the mobile Last.fm downloadable application initially, with other following they tell us. 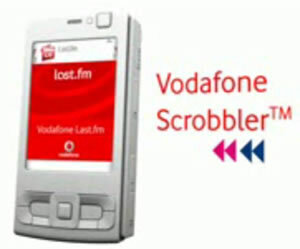 Any scrobbling that you do on your mobile handset will be shared with the knowledge that’s been built already online. To make sure you don’t end up with shocking bills, it’s best to make sure that you’ve got an inclusive data package. Any package form Vodafone that is above £25 per month/ 500Mb is effectively included in this. We asked Vodafone about the financial details of the deal, but got the usual line that they don’t revealed. Last.fm already have a service that runs on mobiles, m.last.fm, but it doesn’t appear to be used that widely as yet. There’s a demo of the service in the video below.